When my baby boy arrived, he weighed 4 pounds, 13 ounces. He entered the world 8 weeks early and spent 29 days in the Neonatal Intensive Care Unit (NICU). When your baby is in the NICU, there is enormous pressure to breastfeed. The nurses rolled a hospital grade pump to my bed side just hours after delivery and minutes after my first visit to my baby’s incubator in the NICU. “Breast milk is like medicine for preemies”, I was told. Every day I pumped around the clock and delivered milk to the NICU in the insulated bags they provided…like I was packing his lunch for school. Every milliliter was carefully inventoried and measured by the NICU nurses. I always knew from the looks on their faces if I had made enough to feed him for the day. Like I said- enormous pressure. Things were going okay until about 10 days after delivery. I developed mastitis on the right breast. For those unfamiliar, mastitis is an infection of the breast tissue. I had pain, high fever, and chills. After two antibiotics it resolved. Then I developed a second mastitis infection on the other side. The pain was excruciating. The infections did a number on my body, my sleep, and my milk production (and yes we worked with lactation consultants and did all sorts of tricks to try and increase production). My husband and I made the decision to switch my son to formula at 3 weeks old. We did it for his health, my health, and my ability to care for him when he was discharged. I can easily say it was the best decision we could have made. 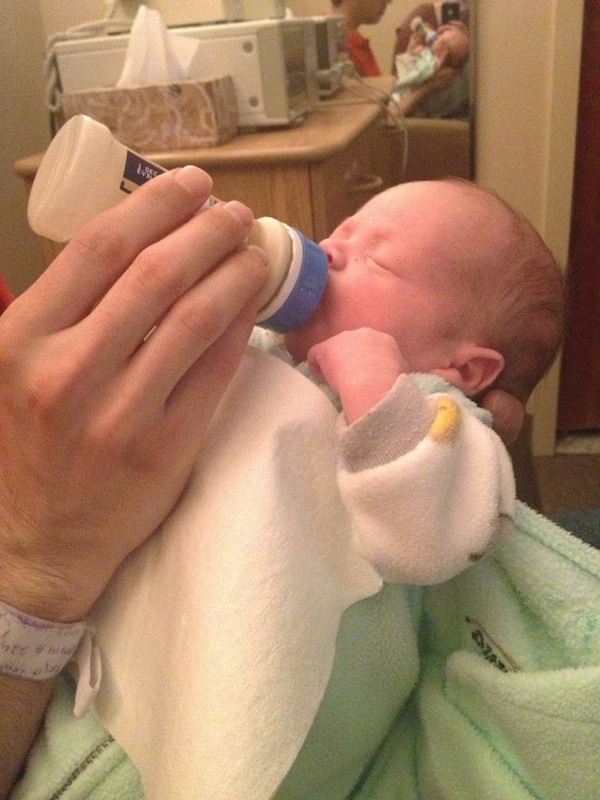 My sweet boy absolutely thrived on his special preemie formula. He tolerated it very well, grew, and got stronger. We are incredibly grateful for formula. To us, it is an amazing public health innovation. It feeds our baby when I cannot. So it is through the lens of both a (proud) formula feeding mom and public health practitioner, that I examine the current public health campaigns focused on birth and infant feeding. A recurring theme for me is concern about the language being used in these campaigns. Somehow public health has not found an effective way to promote breastfeeding without stigmatizing formula feeding. All birthing hospitals in Philadelphia have officially discontinued the practice of giving free formula to new mothers. While I understand that this strategy is supported by evidence, it is part of a larger international initiative to make hospitals “Baby Friendly”. So using that logic, providing formula is “unfriendly” to babies? This message was reinforced by Nurse McGinn who was interviewed for the philly.com story. She reports that she “was given free formula and threw it out”. Quotes like these reinforce the message that feeding with formula is equivalent to giving your kid poison. A friend sent me a link to a wonderful story about supporting formula feeding moms during World Breastfeeding Week. This article does a great job of examining the language being used in this campaign. The terms connect breastfeeding with “winning” and achieving “goals”. So the flip side is “losing” and “falling short of your goals”? This can be a rough reminder for formula feeding moms. For many women, the switch to formula was made after extreme pain, guilt, and feelings of failure. Recommendation: When thinking about health communication, I’m a big fan of testing out campaign terms, along with their antonyms. This can help you to anticipate unintended consequences of your messages. For example, a public health colleague tweeted that we should use the language “breastfeeding is normal” instead of “breast is best”. Although it was not her intention, I read that as meaning that anything other than breastfeeding is abnormal. So formula feeding is abnormal?! Not a great message to send to women. However, this kind of message is often communicated. In the Olivia Wilde photo spread for Glamour Magazine which includes a photo of her feeding her son, she says “Breastfeeding is the most natural thing…” I guess it is, unless it did not work for you and your baby. Then it feels pretty unnatural. What about the women who both formula and breastfeed? Where do they fit in?